Have you ever seen unwanted pop-ups, ads, or notifications from Hogathe.com? This issue can happen if an adware (sometimes named ‘ad-supported’ software) took control of your machine or web-browser. What is adware? Adware is a type of software that is used as an online promotional tool. It’s developed with the sole purpose to show dozens of ads, and thus to promote the goods and services in an open browser window. The adware can substitute the legitimate ads on misleading or even banners that can offer to visit harmful sites. Most often adware software requires more than a simple uninstall with the help of Microsoft Windows Control panel in order to be fully removed. For that reason, our team developed several removal ways which we’ve combined in a detailed guidance. Therefore, if you have the unwanted Hogathe.com pop-up advertisements on your computer and are currently trying to have it deleted then feel free to follow the steps below in order to resolve your problem. Certain of the steps below will require you to exit this web-site. So, please read the few simple steps carefully, after that bookmark or print it for later reference. Read this “How to remove” section to know how to manually get rid of adware which causes annoying Hogathe.com pop-ups. 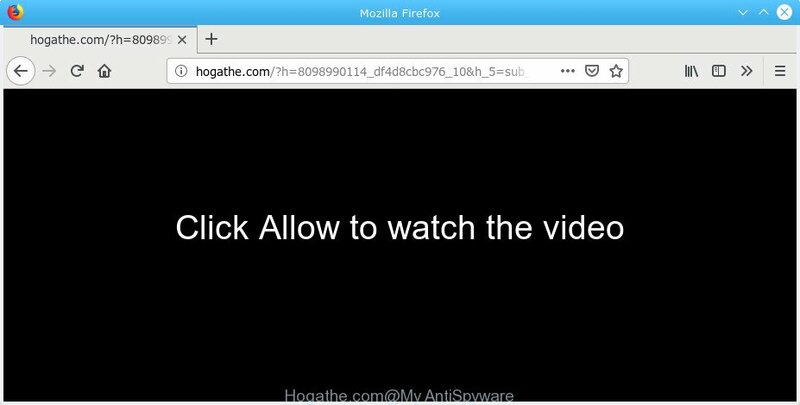 Even if the few simple steps does not work for you, there are several free malware removers below that can easily handle such adware related to Hogathe.com pop-up advertisements. First, go to Windows Control Panel and remove suspicious applications, all programs you don’t remember installing. It’s important to pay the most attention to applications you installed just before Hogathe.com pop ups appeared on your web browser. If you do not know what a program does, look for the answer on the Web. It will open a list of all programs installed on your personal computer. Scroll through the all list, and remove any questionable and unknown programs. This step will help you remove Hogathe.com pop up ads, third-party toolbars, disable harmful extensions and restore your default homepage, newtab page and search provider settings. First, launch the Mozilla Firefox. Next, press the button in the form of three horizontal stripes ( ). It will show the drop-down menu. Next, click the Help button ( ). If you have adware software, Hogathe.com popup advertisements problems or Chrome is running slow, then reset Google Chrome can help you. 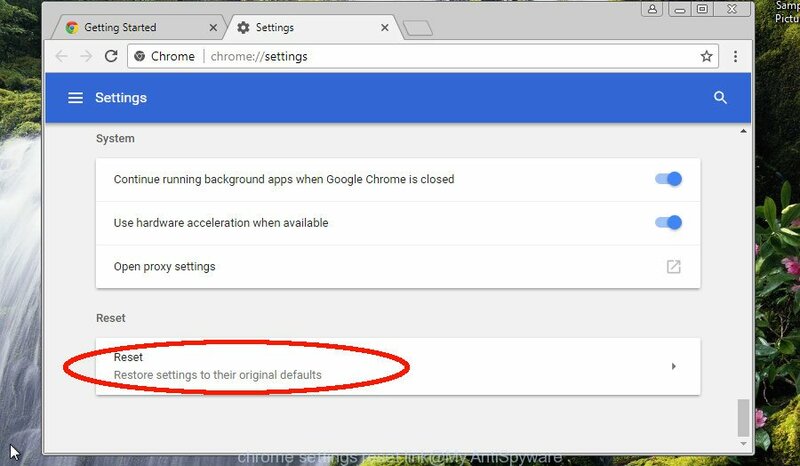 In this guidance we will show you the method to reset your Chrome settings and data to original settings without reinstall. Carefully browse through the list of installed addons. If the list has the add-on labeled with “Installed by enterprise policy” or “Installed by your administrator”, then complete the following guide: Remove Google Chrome extensions installed by enterprise policy otherwise, just go to the step below. First, launch the IE, then click ‘gear’ icon . It will display the Tools drop-down menu on the right part of the web browser, then click the “Internet Options” as shown in the figure below. In the “Internet Options” screen, select the “Advanced” tab, then click the “Reset” button. The Internet Explorer will display the “Reset Internet Explorer settings” prompt. Further, press the “Delete personal settings” check box to select it. Next, press the “Reset” button like below. After the procedure is complete, click “Close” button. Close the Internet Explorer and restart your computer for the changes to take effect. This step will help you to restore your web-browser’s search provider by default, home page and new tab page to default state. If your PC system is still infected with adware which cause annoying Hogathe.com pop-up advertisements to appear, then the best method of detection and removal is to run an anti-malware scan on the personal computer. Download free malicious software removal utilities below and start a full system scan. It will allow you remove all components of the adware from hardisk and Windows registry. Thinking about remove Hogathe.com popup ads from your web browser? Then pay attention to Zemana Anti-Malware. This is a well-known tool, originally created just to detect and delete malware, adware and PUPs. But by now it has seriously changed and can not only rid you of malicious software, but also protect your PC system from malicious software and adware software, as well as identify and remove common viruses and trojans. 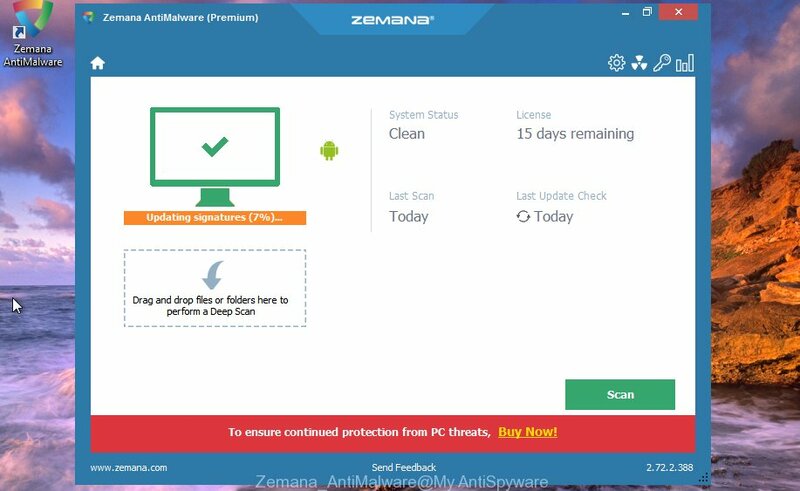 Click the following link to download the latest version of Zemana Anti Malware (ZAM) for Windows. Save it on your Desktop. When downloading is complete, close all software and windows on your machine. Open a directory in which you saved it. Double-click on the icon that’s named Zemana.AntiMalware.Setup like below. 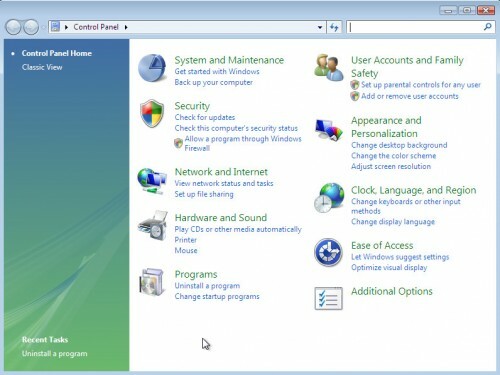 When the setup starts, you will see the “Setup wizard” which will help you install Zemana Anti-Malware (ZAM) on your personal computer. Once setup is complete, you will see window as displayed in the figure below. Now click the “Scan” button to perform a system scan for the adware that responsible for web-browser redirect to the intrusive Hogathe.com webpage. When a malware, adware or PUPs are found, the number of the security threats will change accordingly. 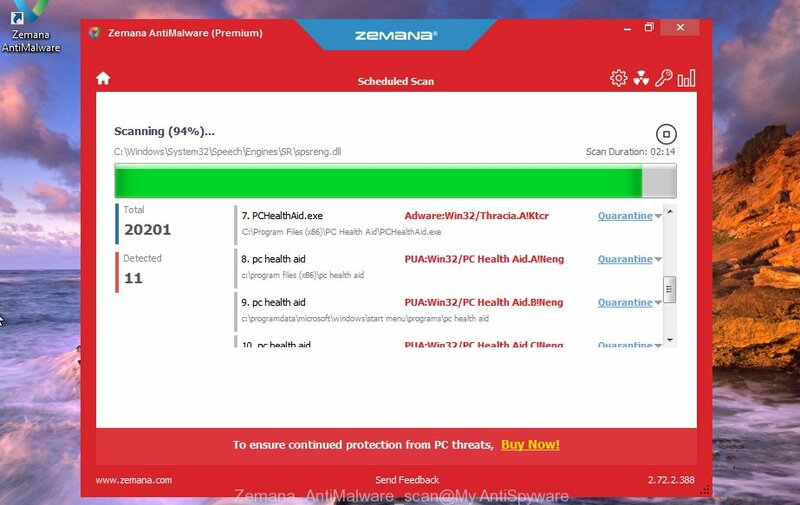 After finished, Zemana Anti-Malware (ZAM) will display a screen that contains a list of malware that has been found. When you’re ready, click “Next” button. The Zemana Anti Malware (ZAM) will get rid of adware software that causes internet browsers to show intrusive Hogathe.com popups and move threats to the program’s quarantine. Hitman Pro is a free portable program that scans your PC system for adware software that redirects your web browser to the unwanted Hogathe.com site, PUPs and hijackers and helps get rid of them easily. Moreover, it will also allow you delete any harmful internet browser extensions and add-ons. Download and use HitmanPro on your PC. Once started, click “Next” button to perform a system scan with this tool for the adware which causes intrusive Hogathe.com pop-up ads. A scan may take anywhere from 10 to 30 minutes, depending on the number of files on your system and the speed of your system. .
After HitmanPro has finished scanning your personal computer, Hitman Pro will show a list of found threats. When you are ready, press Next button. We recommend using the MalwareBytes. You can download and install MalwareBytes Anti Malware (MBAM) to scan for adware and thereby get rid of Hogathe.com pop-up ads from your web browsers. 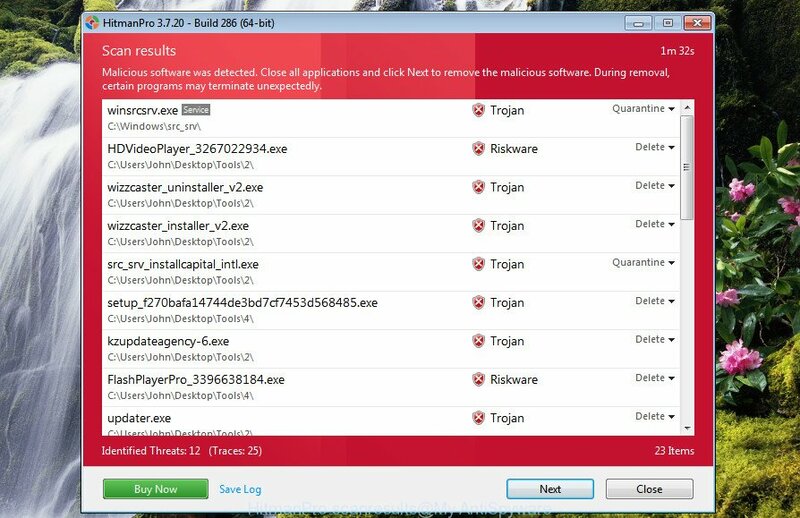 When installed and updated, this free malicious software remover automatically identifies and removes all threats present on the personal computer. Please go to the link below to download the latest version of MalwareBytes for Microsoft Windows. Save it to your Desktop. Once the downloading process is finished, close all applications and windows on your PC. Open a folder in which you saved it. Double-click on the icon that’s named mb3-setup. Once setup is done, press the “Scan Now” button to perform a system scan for the adware that responsible for the appearance of Hogathe.com pop ups. A scan can take anywhere from 10 to 30 minutes, depending on the number of files on your PC and the speed of your PC system. While the MalwareBytes Free tool is checking, you can see number of objects it has identified as being affected by malware. 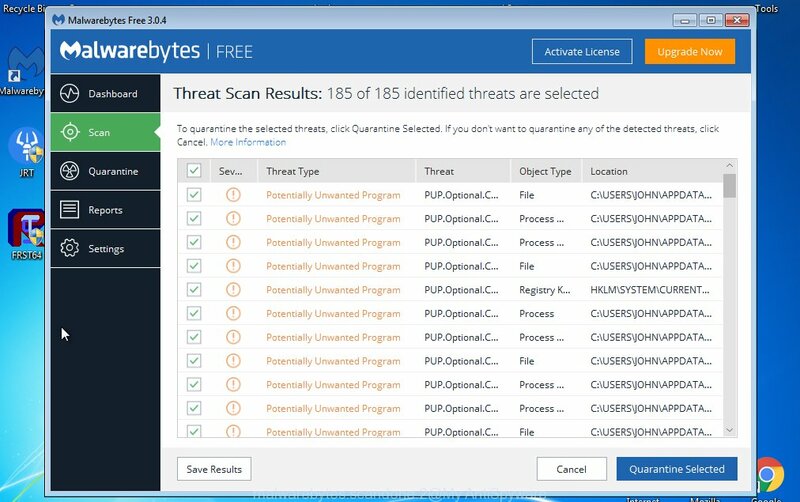 Once MalwareBytes Anti Malware (MBAM) has finished scanning your personal computer, you may check all threats detected on your computer. Make sure all items have ‘checkmark’ and press “Quarantine Selected”. After the procedure is finished, you may be prompted to reboot your computer. The following video offers a guidance on how to remove browser hijackers, adware and other malicious software with MalwareBytes Anti-Malware. Run ad-blocking program such as AdGuard in order to block advertisements, malvertisements, pop-ups and online trackers, avoid having to install harmful and adware browser plug-ins and add-ons which affect your computer performance and impact your system security. Surf the World Wide Web anonymously and stay safe online! When the setup is complete, click “Skip” to close the installation application and use the default settings, or click “Get Started” to see an quick tutorial that will allow you get to know AdGuard better. In most cases, the default settings are enough and you don’t need to change anything. Each time, when you start your machine, AdGuard will start automatically and stop undesired advertisements, block Hogathe.com, as well as other harmful or misleading webpages. For an overview of all the features of the application, or to change its settings you can simply double-click on the icon named AdGuard, that is located on your desktop. Now your computer should be clean of the adware software that causes undesired Hogathe.com popup advertisements. We suggest that you keep AdGuard (to help you stop unwanted advertisements and annoying harmful web sites) and Zemana Free (to periodically scan your system for new malware, browser hijackers and adware). Make sure that you have all the Critical Updates recommended for MS Windows operating system. Without regular updates you WILL NOT be protected when new hijackers, malicious programs and adware software are released. If you are still having problems while trying to remove Hogathe.com pop-up ads from your web-browser, then ask for help here.